Our nursery phase starts after acquiring oyster seed from several different hatcheries at the size of 1.5 – 2.5 mm. 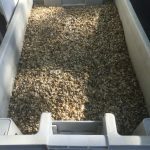 The seed is placed into upwellers at the end of May and depending on rate of growth, they are taken out to the farm from July 1st to the middle of October. 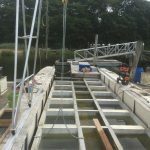 The upwellers are a system developed to hold a large amount of small seed and to force feed them plankton by means of a 1/2 hp pump. The oysters grow fast at this young age and some oysters grow faster than others. For this reason, the seed is graded according to size and separated into the upweller silos accordingly. 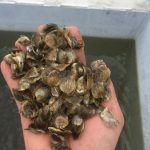 Once the oysters are approximately 1/2″ in length, they are removed from the upwellers and placed into cages for an additional 3 months. From here they are spread on the bottom for the remaining grow-out period. Our farm consists of 22 acres of pristine Pt. 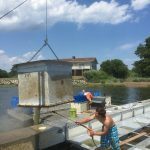 Judith Pond which provides a unique, ideal environment for oyster shell quality and flavor! 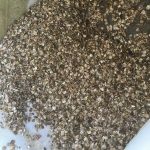 We sell oyster seed to other oyster farms. 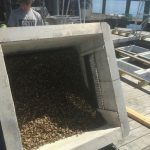 The baby oysters are graded on a 1″ screen, and a 1 1/4″ screen. Seed is available in October and April when we process it with our grading machine. 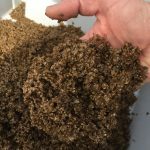 All oyster seed has been disease tested and approved for distribution. Please contact us for a price list. After growing on the bottom for another 1.5 – 2.5 years, the oysters are ready for harvest. 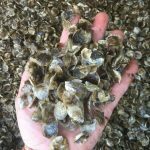 The fastest growers are over 4″ in length and the slower growing oysters are approximately 2.5″. This allows us to sell different size oysters all year round depending on customer demands. The smaller oysters, although short in length, typically have nice plump meats and a hard shell which are perfect for raw bar consumption. The larger oysters are also raw bar quality and are also used for oyster Rockefeller dishes. 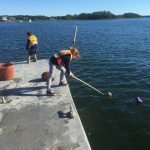 The oysters are harvested by scuba divers or by means of bullrake. They are all cleaned off by a salt water tumbler system and culled by hand on a conveyor. To ensure premium quality, each oyster is graded by shape and size. Only the “cream of our crop” are sold as Salt Pond Selects.